Gracious God, we bless thy Name for the vision and witness of Sarah Hale, whose advocacy for the ministry of women helped to support the deaconess movement. Make us grateful for thy many blessings, that we may come closer to Christ in our own families; through Jesus Christ our Savior, who livest and reignest with thee and the Holy Spirit, one God, for ever and ever. Amen. 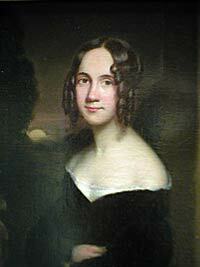 Sarah Josepha Buell Hale (October 24, 1788 - April 30, 1879) was an American writer and an influential editor. She is the author of the nursery rhyme "Mary Had a Little Lamb". She famously campaigned for the creation of the American holiday known as Thanksgiving. Hale was born in Newport, New Hampshire to Captain Gordon Buell and Martha Whittlesay Buell. Her parents believed in equal education for both sexes. Early on in her life, she was educated by her mother and her brother Horatio who taught her what he had learned at Dartmouth; later on, Hale was an autodidact. She married David Hale in 1813,and had five children. Hale, a lawyer, died in 1822 and, in perpetual mourning, Sarah Josepha Hale wore black for the rest of her life. In 1823, with the monetary support of her (then late) husband's Freemason lodge, she published a collection of her poems entitled The Genius of Oblivion. Her novel, published in the U.S. under the title Northwood: Life North and South and in London under the title, A New England Tale, made her one of the first American women novelists and one of the first of either gender to write a book about slavery. The book, which espoused New England virtues as the model to follow for national prosperity, was immediately successful. The book garnered praise from Reverend John Blake, who asked Hale to move to Boston to serve as the editor of his journal, Ladies' Magazine. She agreed and, from 1828 until 1836, she served as editor in Boston, though she preferred being called an "editress". Her collection Poems for Our Children, which includes the now-famous "Mary Had a Little Lamb", was published in 1830. Louis Antoine Godey of Philadelphia wanted to hire Hale as the editor of his journal Godey's Lady's Book. He bought the Ladies' Magazine, now renamed American Ladies' Magazine, and merged it with his journal. In 1837 Hale began working as editor of the expanded Godey's Lady's Book, and remained editor at Godey's for forty years, retiring almost at the age of ninety in 1877. During her tenure at Godey's, many important women contributed poetry and prose to the magazine. During this time, she became one of the most important and influential arbiters of American taste. In its day, Godey's, with no significant competitors, had an influence unimaginable for any single publication today. The magazine is credited with an ability to influence fashions not only for women's clothes, but also in domestic architecture. During this time, Hale wrote many novels and poems, publishing nearly fifty volumes of work by the end of her life. Hale was an early advocate of women's education, particularly higher education for women; she helped in the founding of Vassar College. She was also a strong advocate of the American nation and union. In the 1820s and 1830s, a time when other American magazines merely compiled and reprinted articles from British periodicals, Hale was among the leaders of a group of American editors who insisted on publishing American writers. She particularly liked to publish fiction with American themes, the frontier, and historical fiction set during the American Revolution. Hale adamantly opposed slavery, but she was equally devoted to the Union. Hale is credited as the individual most responsible for making Thanksgiving a national holiday in the United States; it had previously been celebrated only in New England and was largely unknown in the American South. Her advocacy for the national holiday began in 1846 and lasted 17 years before it was successful. Her initial efforts failed to persuade, but finally convinced Abraham Lincoln to support legislation establishing a national holiday of Thanksgiving in 1863.The new national holiday was considered a unifying day after the stress of the American Civil War. Hale retired from editorial duties in 1877 at the age of 89. She died at her home, in Philadelphia, on April 30, 1879.